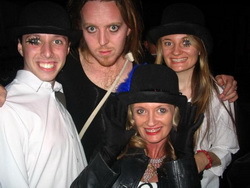 Tim Minchin is a comedian, actor, composer, songwriter, pianist, musical director and a self confessed Rock n Roll Nerd. He has sold out gigs at the Sydney Opera House, won awards at every major comedy festival including the Melbourne International Comedy Festival, Just for Laughs Festival- Montreal and the Edinburgh Fringe Festival where he won the Perrier Award for Best Newcomer in 2005. When did you stop wearing shoes on stage? Well I wore bare feet to uni because I was a bit of a hippie, then started doing comedy gigs at The Butterfly Club in Melbourne. I’d have a list of songs and things to talk about taped to my piano, have three glasses of wine, then take my shoes off to relax. So now I’m in the habit of not wearing them. When I do corperate gigs and wear shoes, it becomes a completely different show, much less relaxed. So much of comedy is about status, the piano is high status and wearing no shoes offsets that, making it low status. Which is good for comedy.